Listeners to the Joined Up Writing Podcast may have heard me talking about my latest WIP – ‘a crime story’ is the way I have been describing it. And that’s exactly what it started out as – a short story. After a few thousand words I started occasionally using the word ‘Novella’ and today, in an email to a writing friend, I unintentionally confessed . . . I’m writing another novel! Yes, another novel, because this will be my second. You may recall I typed ‘THE END’ on the first draft of ‘Let Sleeping Gods Lie’ a few months ago and I have been outlining another project on and off for over a year. Only thing is . . . that’s not the project I’m working on! This is a seat of the pants, first person POV crime novel and I’m just coming up on 22,000 words. I’m slightly in love with my protagonist and so far he is the engine for my plot. I have a vague sense of the end game, but I’m deliberately only outlining a few chapters ahead. This ensures I always have something to write, but that I don’t lock myself in to a story that becomes purely driven by plot instead of character. Yes, I’ve finally cracked it and have found a way to use it that really works for me. I’ll do a separate Scrivener post in the future, but my epiphany came after watching a short video from Joanna Penn. You will need to subscribe to her free mailing list to get access to it, but I really recommend that you do. It’s one of the first links I received from her and it really was as simple as seeing how she uses the software to write her novels. I also got loads of useful info from All Things From My Brain which has a great Scrivener Quick Tips series here. I’m not going to make any more rash promises about blogging weekly or anything, but I am going to try to give regular updates on my progress, share some of my process and also give you a bit of a sense of what I’m working on. So, there will be word count updates, character insights, research topics and anything else I think fellow readers and writers will find interesting. It would be great to spark up a few conversations with other novelists, but also fans of crime fiction so drop me a line in the comments and follow me on Twitter as I would love to hear from you. Perhaps you have some professional expertise in one of the areas I’m looking at for my research? In particular, I want to pick your brain if you have knowledge of how British undercover policing works or if you know any retired safe crackers?! No? Well, it was worth a try. In my next post I’ll give you a little more detail around what I’m working on, as well as my early attempts at writing a log line for the book. Yes, I know that’s a script writing term – but I’ve been reading books about Screenwriting and it all helps. 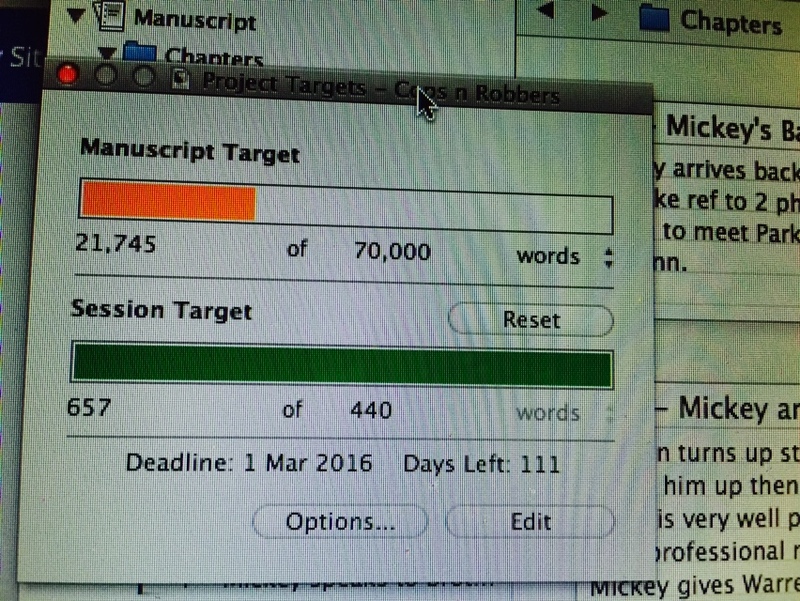 So, get ready to follow what I’m sure will be a bumpy journey to the end of my first draft. I’ll need help – are you with me? Good to hear your news, about the novel, and to see you back here on your blog. I like the new look. I don’t know anything about Undercover Police Operations in the UK, but this book might help if you don’t already know about it. It looks well researched. This documentary about Mark Kennedy, ‘Confessions of and Undercover Cop’ may also give some incite. I’m looking forward to your updates and hearing more about Scrivener too. Thanks Maria. Funnily enough the book you mention is the one that gave me the spark for the initial story! Cheers for the tip on the film too – looks really interesting.